From Key West, Florida to Kodiak, Alaska, we have completed a wide range of projects including commercial office buildings and retail shops to federal, state and municipal buildings. 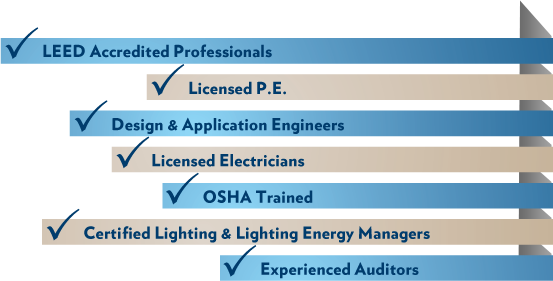 The PES staff is comprised of industry leaders with years of combined experience and qualifications. We believe the best way to get it done right is to do it yourself, which is why we use our own expertly trained employees to manage and build the project. In addition to their technical expertise, PES personnel meet the strictest government and military security clearances from facilities that range from middle schools to multi-million square foot federal military bases. This is why PES is looked to as the industry leader in sensor and lighting energy conservation projects.